I’m starting to think charity events and Real Housewives stars mix as well as sweet tea and vinegar. 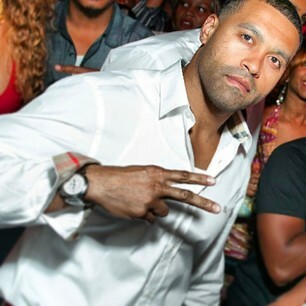 Stirring the teacup this week is Real Housewives of Atlanta’s Apollo Nida, husband of Phaedra Parks. According to Radar Online, Apollo was invited to a charity fundraiser that supports battered women and children–Dio Bambini–and the organizer assumed the Phine fitness star’s presence was gratis. Until…it wasn’t. For those not up-to-date on Apollo’s sketchy past: he’s an ex-convict with a five year rap sheet for opening a fake car dealership and applying for loans with stolen identities. And recently he’s been arrested and accused of bank fraud and identity theft. Therein lies the dilemma. Decarlo fears forking over the cash and Apollo running with it. See, federal prosecutors gave Apollo until April 25th to make a deal on his charges otherwise he will go to jail. The charity event is on May 2nd. Apollo took to Youtube to speak his peace and clarify the $2,000 is for travel expenses not his personal piggy bank. And believes “2,000 is generous” Hmph. Oh, and the contract stipulates a 50% refund if he’s a no show. Check the video below. Welp, the charity has not been recognized on Charity Navigator and it isn’t listed as a 501c org either.